I have recently been looking quite a bit at a few preludes and fugues from Bach’s second book of the Well-Tempered Clavier, and the D major fugue, one that I played as an undergraduate student, has particularly caught my attention. The fugue takes on an almost choral character rather than a pianistic one, due primarily to its rather placid subject, which can be divided into two motives. Interestingly, the opening X motive implies G major more than it does D major, and the absence of C# in the entire subject infuses it with a slight tonal ambiguity that Bach exploits throughout the fugue. This fugue is one of the mostly tightly-knit ones in the WTC books, with Y in particular pervading the fugue from beginning to end. The fugue is 50 measures long, and considering the quarter note as the beat unit, disregarding the “cut” time signature, there are 200 beats. (Hereafter, beat numbers will assume the quarter-note beat, for sake of clarity.) In only 39 of those 200 beats is no instance of the Y motive present, and in only 9.5 of those 200 is no instance of X or Y present. 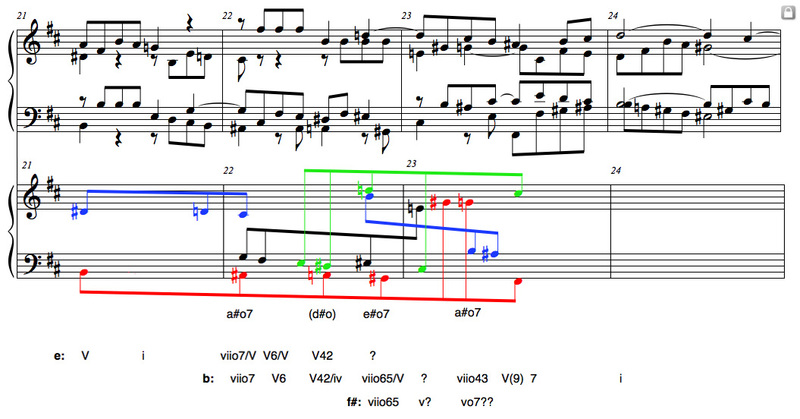 Of the 873 notes in this fugue, 436 of them, almost exactly half, belong to an instance of Y. Doing the math, that’s 109 instances of the Y motive! As you can see from the colored markings in the example above, Bach has included three consecutive cross-relations in this fantastic passage. If a student of mine submitted a passage such as this, my response would likely be to ask whether he had ever actually played through his part-writing being fairly certain that he had not. So, I thought I would do Bach a big, big favor and fix his questionable voice-leading. Okay, not so much. But I wanted to “fix” the passage simply to see how easy (or difficult) it would be to do so. I thought this process might somehow give insight into why he wrote what he did. I found the task of “fixing” the passage not very difficult at all. In fact, I came up with four different fixed versions. Fix #1 is perhaps the simplest fix, with all three cross-relations being eliminated. On measure 22.3, the tenor voice’s D# has been changed to D-natural to match the soprano’s D-natural. The bass has been changed from A to B, since the A makes less harmonic sense without the D#. The E#-E cross-relation is eliminated by the simple removal of the E#. The G#-G cross-relation is removed by the change in the soprano from G# to G-natural. I slid the alto’s G over one half-beat in order to make the S and A more independent. Easy fix! However, the fix comes with effects detrimental to the overall passage from a purely musical standpoint. The primary weakness, to my ear, is the overemphasis of B, both in the bass and as a harmony. The bass’s B2 in measure 22 (beat 3) has no freshness since the B2 was heard in m.21. Also, the F# chord heard on beat 3 of measure 23 no longer has its wonderful stabilizing function. In Bach’s version, that F#2 in the bass takes the important role of reorienting the tonality. In my version, the B minor chord in measure 22 ruins the need for reorientation. One may also notice the G-C# augmented 4th that is created in the subject’s soprano appearance in measure 23. So fixing the three cross-relations came at the cost of inserting a questionable melodic interval (not that Bach avoided augmented melodic intervals entirely (see the Crucifixus from the B minor Mass! )), not to mention the fact that the passage a much blander and far less interesting. In Fix #2, the D# is restored to the tenor and Bach’s D#-D cross-relation is fixed by giving the soprano a D#. The A in the bass is kept this time, though contrary to Bach’s version I actually resolved the measure 22.3 implied V42 of E minor (V42/iv in the key of B minor) normatively, to a first inversion E minor chord on the following downbeat. To achieve this, I removed the E# in the tenor, thus eliminating the E#-E cross-relation. This fix restores the reorienting function of the bass’s F#2 on measure 23.3. It also adds import to the D-naturals that appear in the upper voices on measure 24.1 since the soprano’s D5 in Bach’s version is changed to D# in mine. I also like the manner in which the two Ds in m.24 are approached, really giving a sense of arrival which for the soprano is further emphasized by its agogic accent. Fix #2 is also not without its faults. First the D#-G augmented 5th in the soprano (mm.22-23) is certainly problematic, and the D# is awkwardly left unresolved when the E minor chord arrives on measure 23.1. As in Fix #1, a strong B minor chord is inserted in Fix #3 on measure 22.3, eliminating the D#-D cross-relation. Unlike Fix #1, Bach’s E# in the tenor at measure 22.4 is kept, and the E#-E cross-relation is fixed by transferring the E# to the alto. This E#4 extends the tonicization of F# minor and perhaps heightens its arrival on measure 23.3. The G#-G cross-relation is removed by changing the G-natural on measure 23.2 to G#, letting it slide down to G-natural only on beat 3. The G# may seem a little awkward with B minor being implicated (A# appearing in the tenor), though the aural effect is not overly awkward. The beat 2 G# can be simply heard as a remnant of the tonicized F# minor key area. One may notice the B-E# diminished fifth in the alto’s fugue subject in measures 22-23, yet this is not problematic, and of the 23 appearances of the subject in this fugue, three of them open with a diminished rather than perfect fifth (mm. 33-34 (S), m. 43 (B), and m. 45 (T)). Fix #4 is the most adventurous. The D#-D is once again eliminated the same way it was in fixes 1 and 3. But here, the E# is respelled as an F-natural, and when combined with the added G-natural in the bass, creates a V7 of the Neapolitan key area. A root position Neapolitan appears, as expected, on measure 23.1, and with the bass moving to E on beat 2b, the N53 is transformed into N6, its usual bass position. Therefore, the E#-E cross-relation is eliminated by the respelling, and more importantly re-functioning, of the E# to make it F-natural. And the G#-G cross-relation is eliminated by the alteration of all tones in the first two beats of measure 23 to conform to the Neapolitan harmony. Once again, the B minor chord on measure 22.3 may overemphasize B as a tonal center, but the more drastic shift into the Neapolitan key area alleviates this overemphasis and the return to B on measure 24.1 is once again satisfying, at least to a greater degree than it was in fixes 1 and 3. Obviously, Bach was well aware that the cross-relations could be fixed. The question remains: why did he write this passage the way he did? It most certainly wasn’t because the three appearances of the fugue subject in stretto fashion dictated or necessitated these cross-relations. At two different times in the second half of the fugue, all four voices are involved in a simultaneous stretto presentation of the subject. I began to look for other reasons. I noticed that two musical ideas drive the passage in terms of voice-leading and harmony: descending chromatic lines and fully-diminished harmonies. The proliferation of chromatically-descending diminished chords results in an ambiguity of tonal center. Combine these chromatic descents with voice transference and you get cross-relations. In addition to the E-D#-F#-E# instance of the monogram, which most recognizably announces the motive, each cross relation is involved in an instance of the monogram. This entry was posted in Uncategorized and tagged analysis, bach, cross-relations, fixing Bach, fugue, music theory, WTC. Bookmark the permalink. That’s really interesting … thanks! A rather useless exercise, but if you have fun, be my guest. Because it does not spell out anything…. E, D#, F#, E# is the B A C H motif transposed, Alex. I’m glad someone’s written something about this extraordinary fugue! It’s not just original, I find it very moving. Thanks for reading! I agree with you. An unjustly neglected fugue.